Money Talk :: - Should I convert my Standard IRA to a ROTH IRA? I hope I am not breaking any Money Talk rules with this post. If I am, just report it to the op and I�ll notice the infraction when I see the post disappear. I am preparing a web page for a local investing group meeting in October and I would love to get some advice from all of the nationwide members on its content. Have I made any false statements? Is there a better way to organize my thoughts? The page is designed to compare the benefits of a ROTH conversion to the impact of the taxability of your Social Security benefits during retirement. The page is located at www.howtofixsocialsecurity.com/conversion.htm and I would love to get whatever feedback I can. I will monitor this thread, evaluate any suggestions, and post a response for any changes I make to the page. The changes will appear at the same time as my secondary posts. Again, I hope this is a legal post and I appreciate any responses. I hope the page is helpful and everyone is free to use any of its content. Looks good, except that you didn't account for the time-value of money. Eg, if I pull $2800 out of my taxable account and use it to prepay the taxes on that $10,000 IRA, I will lose the 11%/yr earnings on that $2800 for many years to come. And by the Rule of 72, my $2800 would be doubling every 7 years. I looked at it a different way. To make the example easier to follow, let�s say your tax bracket is 25% and your State bracket is 8.33% for a total of 33.33%, one third. You convert $30,000 of your IRA to ROTH and pay the 33.33% from the conversion money. The ROTH now has $20,000. Compare this to not doing the conversion. After a period of time your investments double in value. The 30 is now 60 and the 20 is now 40. If you withdraw the 60K and have to pay 33.33% in taxes, that is 20K and you wind up with the same 40K from the IRA after tax as the 40K in your ROTH. That is why I say on that page that the profitability of doing the conversion is dependent on your tax rates before and after conversion. A reasonable tax difference for most of us would be the 25% federal bracket before retirement and the 15% with an 85% surcharge which is 27.75%. Your bracket is higher in retirement than before so it is profitable. Either way, the conversion does give you more flexibility during retirement. If a couple earns $68,000 ($40k 'other ' income & $28k SS), then 50% of their SS income is taxable (using your example, the 15% goes to 22.5%). It takes a lot of income to reach the point where 85% of your SS is taxable, a little over $80,000. At that point, your average tax rate is 9.7%, only the last (marginal) $1000 is subject to 27%. So yeah, for high rollers, a small Roth conversion could make sense. Half of $28,000 is $14,000 plus the $40,000 of �other� income is a total of $54,000 and the 1993 amendment set the 85% level to start at $44,000 for a married couple. From $32,000 to $44,000 was taxed at 50%, $6,000, and $10,000 was taxed at 85%, $8,500, for a total of $14,500 taxable SS benefit. Their maximum taxable SS benefit will be 85% of their $28,000 benefit will eventually be $23,800 if they continue to bring in more income. But, they are already into the 85% bracket by $10,000. When the amendments were written it was true that they were aimed at the rich, but congress purposely did not make their taxation breakpoints COLA adjustable so that today�s median family income of $55,000 makes that part of your Social Security in taxable. With your example of a $28,000 SS benefit the 85% level starts at only $30,001. Unfortunately it do not take �a lot of income� to reach the 85% taxation level. You get to 85% thousands of dollars before you get to the 25% tax bracket. There is a great tool on line, TaxCaster by TurboTax, that will illustrate all of your tax questions. I use it constantly to see what my end of year tax situation is estimated to be. I went there and told it I was married and we were both 65, then went to �Other Income� and filled in $40,000 IRA income and $28,000 SS benefit. Total tax was $3,791 and I was in the 15% bracket with $31,400 taxable income. I added $100 to the IRA income and my taxable income went to $31,585, an increase of $185. Assume one has $10,000 per year to put aside for retirement. Assume he is, and remains, in the 25% tax bracket and investment return is a constant 10%. The entire amount may go into an IRA, or he may pay the tax and put $7,500 into the ROTH. He puts the money in for 10 years and then takes it all out over 10. His takeout is essentially the same for both (~$1630 per month). So the choice becomes a retirement tax bracket estimation game. If you think your bracket will be lower in retirement go for the IRA, but minimum distributions may bump up your backet. If you think your bracket will be higher, go for the ROTH. That experiment was trivial, but gives the (should be) expected result that you need to know more to choose wisely. Over the past 15 years I have written a computer program that is essentially a lifetime financial simulator that helps you to understand the 'more' required for wise choice. Now I fancy that I want to sell it, but first I need to give away some copies to see if anybody else thinks it is useful. Look at http://intermountainac.net/WI2.php and if you want a freebie email me at cvfac-info@intermountainac.net and I'll send you one. I have been investigating this a lot over the last 4 months. From what I can gather, if you use the IRA funds to pay the taxes, the only thing that really matters is your tax bracket when you convert vs. your Marginal tax bracket when you are retired. PS: These are not our numbers, they are only examples! If you pay 25% pre-retirement to convert $4,000 traditional IRA into $3,000 ROTH and then the market value, time-value, or whatever causes your funds to double over time, The traditional IRA would have become $8,000 and if you paid the same 25% would be $6,000 after tax. The ROTH would be the same $6,000 and no taxes are due. This chart shows examples of your marginal tax brackets during retirement including the 50% and 85% taxability levels of Social Security. A very common bracket will probably be 27.75% (15% x 185%) so your after tax would only be $5,780. The pre-retirement conversion would have a very small $220 value. NOTE: the scale of the chart is gross income per individual. The chart also shows the �Marriage Penalty� where a married couple will pay higher taxes earlier. 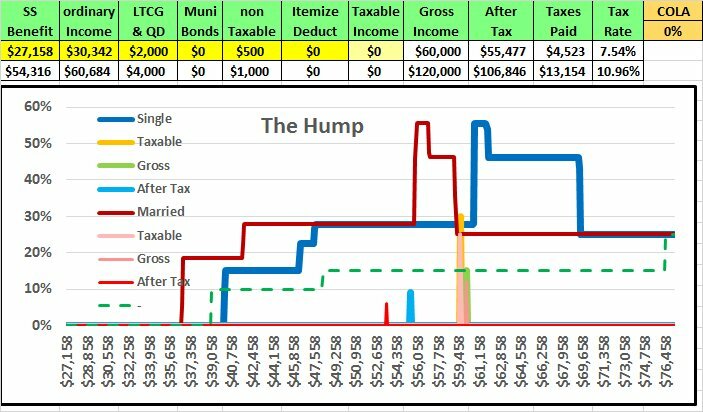 The penalty reduces back to zero after the single individual pays their Hump taxes. The value would jump wildly if your after retirement marginal bracket hit the 46.25% (25% x 185%) level or the 55.5% level. The 55.5% level is reached when you have dividends or capital gains which causes a bump up of the 15% bracket to 30% when the delayed taxation of the gains happens which becomes 55.5% (30% x 185%) during retirement. Assuming the tax codes remain the same and the markets continue to rise, and you know what assume does to U and ME, it is still better to pay the conversion taxes from other sources which is the same as making an additional contribution to your ROTH.